Akin to a learned and all-knowing dowager, she has been a lantern of warmth over the Cantonment for over 30 years. This wise old Chinese maiden, Memories of China, has witnessed the city’s landscape change, mature, evolve, watched her peers disappear into oblivion. Today, she till “woks” the talk beautifully. Now, as Taj MG Road gets a wand of new spangled magic in a brand new avatar, it’s also ready with open arms to welcome all. The refurbished Taj MG Road celebrates its new look with contemporary interiors, wooded exteriors, larger gold and beige-toned sensor controlled rooms, a brand new coffee shop and al fresco by a quaint poolside with Taj’s iconic warmth. The change comes after 19 months of dedicated refurbishing as the hotel was turned around. What was an after-party hangout in the 80s, the place for a sumptuous midnight meal for some, a languorous dinner or business hotel for others, comes revamped courtesy David of the Singapore-based firm DBTA. Swanky, earthy textures, the hotel revisits its glory days with this new look, as General Manager Manoj Mathew V.M. scurries around, an eagle-eye running over every detail. A jewel from Bengaluru’s past, Memories of China (MOC), started when Chinese cuisine first began to gain favour, back in the 1980s. Three decades later, it’s still a favourite. Taj’s brand new coffee shop augurs a new era. Taking lessons from history, it’s called The Trinity Square, and has clean wooded lines, an English countryside feel in a space that has incorporated the previous Mosaic and Graze, and also houses cake shop, Sugar and Spice. Chef Saikat has added biryani, kathi rolls, lamb shanks, and coastal delights to the menu. A woodfire pizza oven, and a two-pronged buffet with a gentle joie de vivre, it reminds one of an era when Taj Residency’s coffee shop was the go-to. Seems like it’s that time once again. If food and emotions are intertwined into the fabric of a desi foodie, so is MOC – That steadfast place to tuck into authentic Chinese, where the food, ambience and service is stellar. Executive chef Saikat Nag, who was earlier with Taj Lands End, Mumbai, and in London with Taj Bombay Brasserie St James Court, brings his signature cuisine, Indian and coastal to the new Taj’s coffee shop too. Chef Nag sat with Master Chef Jinhong Luo to add flavour to the sumptuous MOC menu which retains its old soul, quite like the wise dowager. Chef Luo’s signatures crystal prawn dumpling with ginseng flower, wok-fried shredded pork with Szechuan vegetables, add flavours to the exhaustive menu as do the master chef’s finesse in dim sums and dumplings. “Memories of China has been a statement since the very beginning. Our challenge has been to evolve by acknowledging trends with authenticity and consistency,” says the chef who is originally from Hunan, a mountainous province. For those who love the Chinese Steam Hot Pot, Chef Luo has a worthy offering. “We source exclusive ingredients from China – wild asparagus, enoki mushrooms, honey beans, ginseng, pack choy, longan, grouper fish and ma po tofu. Our menu features a careful selection of Hunan, Cantonese and Szechuan dishes,” says the chef. A flavourful green tea started our forage into this old hand at Chinese cuisine. The popular steamed Coriander Chung Fung (rice roll) had a wholesome and caramel-ly soya stock, with wild mushroom – beautiful with spring onion nibbles. Then came a simple pork dim sum with a thick broth on a soup spoon, to be slurped whole, we took it bite by bite (given its size!). With a layer of burnt chilli paste and tangy spicy sauce, it was delicious. The parcel could be thinner, though. 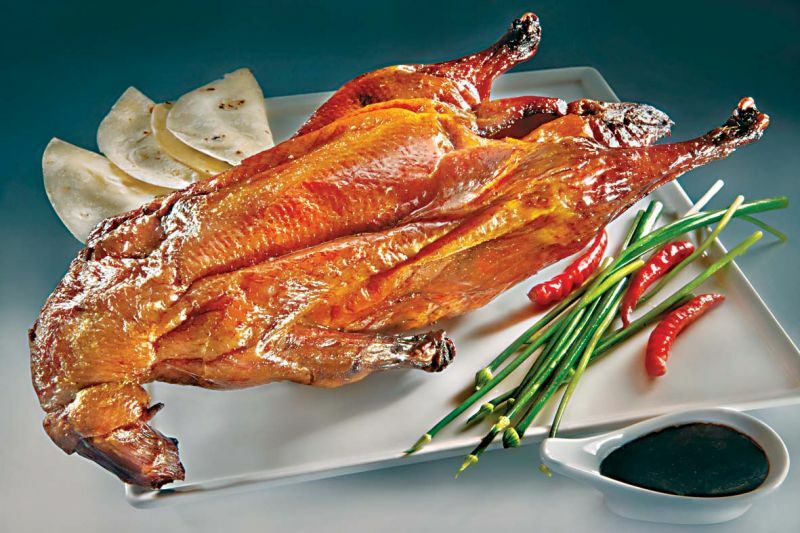 The Peking duck, a favourite, was made with a flourish, carved by a sous chef, in an interactive table, as we chomped on fresh, crackling and glazed slivers of duck meat with cucumber and chilli sticks with a lip-smacking hearty sweet bean sauce to imbue it with flavour. The duck was dry… the meat is such… we added more scallions, green onions and sauce. The main course came next, a large menu to choose from. A delicious, smoky burnt garlic fried rice that one can chopstick away as is. The hakka noodles were okay, and the kung pao chicken with cashews was subtle in flavour. We loved the freshness of the dishes. A black bean chilli fish with an unmistakeable peppery hint with a flaky steamed grouper complimented the grainy spicy of the bean. Wow. And the stir fried Chinese greens were sautéed perfectly. “The vegetables are sourced specially to give the dishes authenticity. The old menu is popular, and weekends are packed, so we have stayed true to MOC’s essence,” adds Chef Saikat. “MOC has over 30 years of knowing a city’s palate. That’s a rarity today. It is also the only place where the interiors are untouched,” explains Praful Narchal, director, sales and marketing. The spicy golden fried garlic prawns were pink, crispy and delicious, we loved the sprinkling of chilli and crunch though a nice honey chilli dip would have enhanced the bite. The chef also stir-fried the remaining duck – it was scrumptious. We had date pancakes, glazed with honey, crunchy with a creamy litchi ice cream to end the meal. Satiated, and rightly so. The simplicity of an old hand serving delights over decades is what keeps Memories of China pertinent, and with emotions as the Indian calling card… suffice to say there are many more decades under MOC’s belt!